A little while ago I posted to this space the program note I wrote for the Shaw Festival production of Top Girls, one of my favourite plays by the prolific and inspiring British feminist Caryl Churchill. At that time I promised I’d write a review of the production after I saw it – which I did last Friday night, at the luminous premiere in Niagara-on-the-Lake. We had a perfect evening for the festivities – cloudless blue skies dying to black under the twinkling lights of the Court House Theatre. Opening party-goers dined beneath a festive canopy in the gardens at the historic Lakewinds guest house before undertaking the short, picturesque stroll to the show. At the interval, we spilled outside with wine and ice-creams as the stars came out. Inside, the stars of the show lit up the stage. And yes: it was every bit as charming, as dream-like as it sounds. Before I share my thoughts on the production proper – which I found smart, sharp, fun, and moving – I want to share the story of how I came to be at the glamorous premiere I’ve just described. Bear with me – there’s good reason for this diversion. I’ve written program notes for several theatres in Canada and the U.K., and each company compensates essayists differently. I’ve been given honoraria (including by the Shaw), complimentary tickets to several productions (from festivals like Stratford that run a season in repertory), access to directors and key artists, as well as royalties from the subsequent reprinting of notes when shows go on tour. But this was new: Shaw invited me to attend the opening night dinner for Top Girls as well as the cocktail reception beforehand, during which I would meet both the talented artists who created the show as well as a large helping of wealthy donors, those who help keep Shaw going from year to year. Then we would all see, together, the opening performance itself, seated cheek-by-jowl with Shaw’s theatrical glitterati as well as a brace of critics from over the lake in Toronto. The Shaw puts on a great party, and I and my companion had enormous fun sipping our gin and tonics under the big white tent. I won’t lie, though; I found it rather uncomfortable to be seated at a table with jobbing artists on one side and extremely rich people on the other (however generous, friendly, and philanthropically minded those people are). I could tell from brief looks and a few small moments of awkwardness that the artists around me were used to this routine: of course the dinner offers a good time, but it’s also work for them. They must be consistently convivial and forthcoming with their chat; they help to star-dust the evening for the donors who pay for elite access to the festival’s inner workings when they cut their big cheques. Then it dawned on me: I, too, was at work as I munched my seared tuna. No wonder I had been nervous beforehand! Although I’d not lit the show, designed costumes, acted or directed, I had provided creative labour for the festival. As they flattered me with a gala invite, the Shaw staff also slyly invited me to perform my virtuosity as a researcher and writer for those seated near me. Creative (or “immaterial“) labour isn’t a new thing, of course: artists have always been linked to patrons with money. (If you’ve never seen Impromptu, watch it now!) But the emergence of the creative class as a broad spectrum group is a modern phenomenon, and in its current iteration it is tied to the rise of neoliberalism as a socio-political economy for the information age. Creative labourers generate content (they are writers, graphic designers, web developers), manage consumer experience (they are brand managers or ad execs), set a mood (if they are not designers, they work “in design”), shape a zeitgeist (inevitably, they write blogs. Ahem.) They may well be talented artists making real, tangible things – like beautiful pieces of theatre! – but just as importantly they create an aura, a sharp desire that makes others want to be a part of their culturally-aware awesomeness. The building and maintenance of this aura is key to the work accomplished by today’s creative workforce – just as it was key to the work the artists and I did under the tent at the Top Girls opening party. 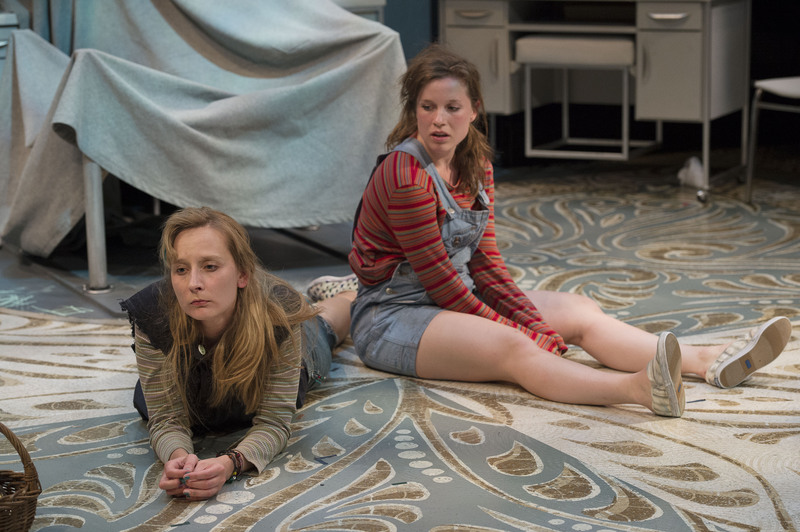 Top Girls is a play about the cruelties of neoliberal economics: it pits its sixteen female characters against one another in the fight to the top of the “super-business-woman” pyramid. After eating my gala dinner and then watching director Vikki Anderson’s production, however, I realised that Top Girls is also very much a play about the pressures of the creative class, for women artists and brand executives alike. And while my gala experience was helpful in framing the reading I’m about to offer, it was ultimately two particularly innovative choices made by Anderson and her team that threw this production’s focus on the working lives of creative women into stark relief. So Anderson’s frame-story was one about gender, power, and the performance of self – Judith Butler 101. But it was also more, and for me this “more” was the bit tied to the playful dancing. These women didn’t trudge on joylessly; they entered smiling, chatting, grooving, and eager to share some of this time with one another. Yes, we saw their silent work at their mirrors, but we also saw them coalesce as they worked into a community of artist-professionals who were supporting each other through their shared tasks. Several danced together; two exchanged quite intimate words and gestures. Most gave each other shoulder squeezes and short pep talks that I suspect were more for one another than for us – gestures of solidarity and support among a group of women about to go to work for the night, rather than performances of “play” for audience edification. Top Girls was written in the early years of Margaret Thatcher’s rule; it demonstrates how the cult of the individual she championed wrecks the potential for feminist community and feminist political solidarity across difference. Anderson’s frame-story implies that community is actually an essential component of success for a contemporary “creative” woman. Is it a bit utopic, perhaps unrealistic? Maybe. But, then again, each of these seven performers killed it on Friday night – so if those squeezes, grooves, and supportive words at the top of the show were made of real stuff, they sure did real work, and it got real results. Anderson’s second innovation has to do with Angie, the high-flying main character’s not especially high-achieving niece. In many productions of Top Girls Angie is costumed blandly and played as a bit of a lump – exactly how her bitter mom (Joyce) and her successful aunt (Marlene) describe her to others. 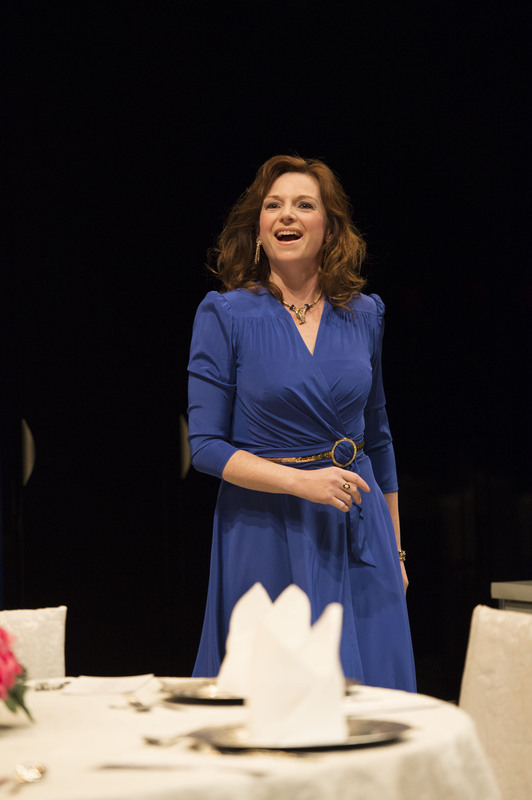 But Anderson clearly doesn’t believe Joyce and Marlene: Julia Course’s Angie is vivacious, wacky, smiley, full of life – frankly hilarious, a show-stealer. No wonder Kitty, the smaller girl down the road, wants to play with her all the time! Course’s Angie is also glued to her exercise book, an item Churchill mentions only very briefly in Act 3 but which Course and Anderson choose to read as evidence of Angie’s burgeoning creativity, a zest for drawing, words, and imaginative play. Here, Angie isn’t a dullard who “isn’t going to make it” because she’s not smart or ambitious (as Marlene declares meanly at one point); nor is she doomed to failure because she doesn’t come from money and hasn’t had opportunities. This Angie’s trouble comes from the fact that her brand of imagination – the kind that takes wing under forts built of blankets, or in notebooks hidden under mattresses – isn’t valued by the culture around her, a culture that lusts after the kinds of creativity Marlene peddles when she tells her employment agency clients how to present themselves in an interview, what parts of themselves to reveal and what parts to conceal. Marlene’s creativity is for-profit, carefully honed and framed, but Angie’s creativity is messy, chaotic, just for fun – for pleasure with no strings attached. If she could tame it, shape it, sell it… well then, surely she could make it. But that’s not Angie’s style – and that’s why Marlene condemns her as someone with no style at all. Top Girls opens with a lavish dinner party to celebrate Marlene’s promotion to director of her agency; I suspect Marlene would make a pretty attractive guest at any opening night gala. Angie, on the other hand, would be a complete disaster at a glam dinner: all legs, arms flailing; all too-small, too-shiny dresses and mad, frenetic energy. Or, then again, maybe she’d be just what more gala dinners need: less work, more unbridled play.